Compensation was provided by Guardian via MomTrends. The opinions expressed herein are those of the author and are not indicative of the opinions of Guardian or Momtrends. It’s summer time and that means my children are in need of activities to keep them busy. I love when we all go outside and play, but living in Texas the mosquitoes are viscous and don’t like when we invade their outdoor space. So when we go outside and play with things like this Homemade Sidewalk Paint, we make sure to protect ourselves from hungry mosquitoes. 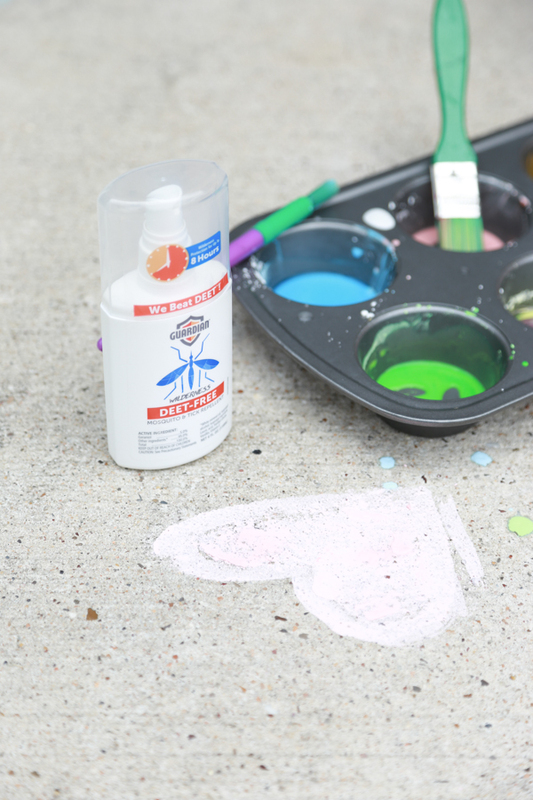 Making Homemade Sidewalk Paint is super simple and only requires 3 everyday ingredients that you probably already have at home in your kitchen. 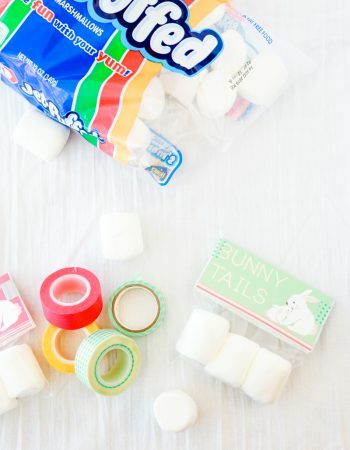 The ingredients you’ll need are cornstarch, water, and food coloring. Place one teaspoon of cornstarch into each well in the muffin tin. Add 2 teaspoons water to each well in the muffin tin and stir until completely dissolved. Dip a toothpick into gel food coloring and swirl it into the cornstarch mixture. Mix together using a spatula until food coloring is dissolved. 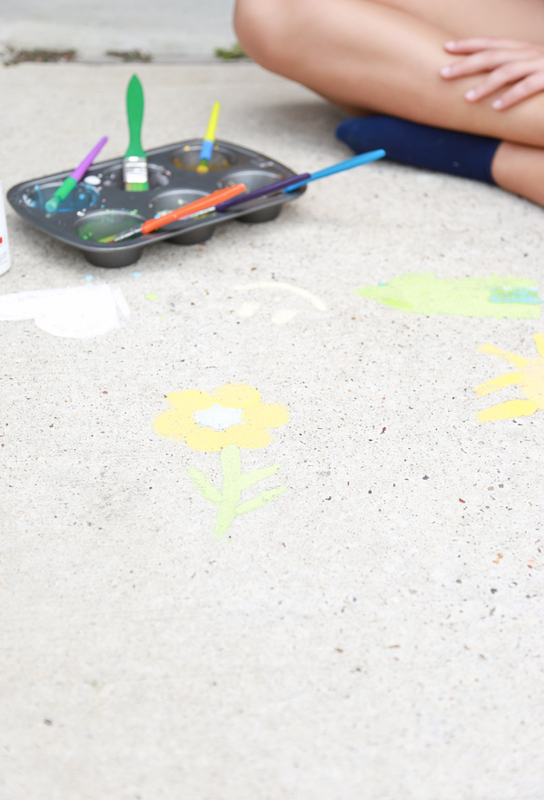 With paintbrushes of all sizes, begin painting on the sidewalk or driveway. Have fun! Once you’re done playing, you can either wash the sidewalk down with a water hose or wait for the next rain to wash it away. 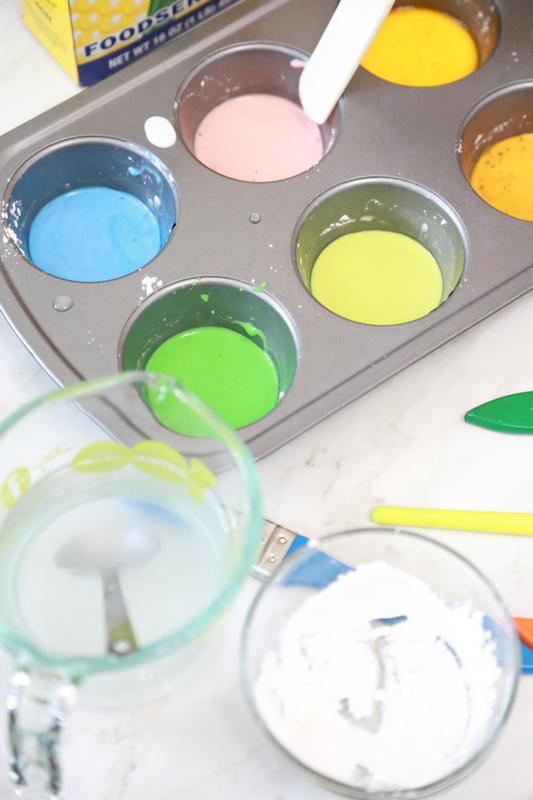 Watch our Homemade Sidewalk Paint video! Since we live in Texas, we have some big bugs here. When you hear the saying, “Everything is bigger in Texas!“, it’s true! Even our bugs are big. During the summer months it’s hard for us to enjoy time outdoors unprotected because the bugs are a huge nuisance. It’s a race when I check the mail to see if I can outrun the mosquitoes. Thankfully I ran track in school so I’m kind of fast. Having a way to protect my family from mosquitoes and ticks is so important. But having a plant-based alternative like Guardian is a necessity. 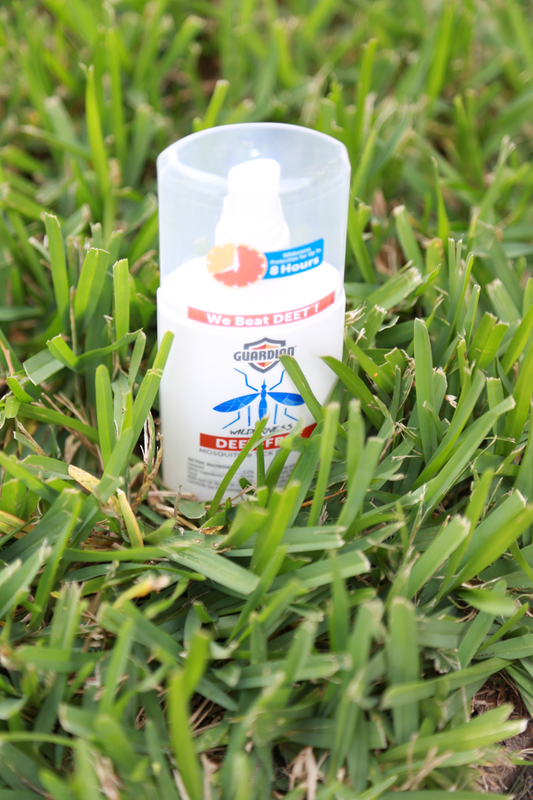 Guardian is a non-toxic alternative to DEET-based repellents that is proven to repel mosquitoes for up to 8 hours and ticks for up to 4 hours. Do you know what that means for you and your family? More time playing and less time reapplying. I know that life is busy and time is limited so being able to enjoy time outdoors without wasting time reapplying bug repellent is such a convenience to me. The citrus-vanilla scent that comes from the essential oil ingredients is pleasant and wasn’t irritating to my nose. Some products that are scented give me a headache, but Guardian did not. 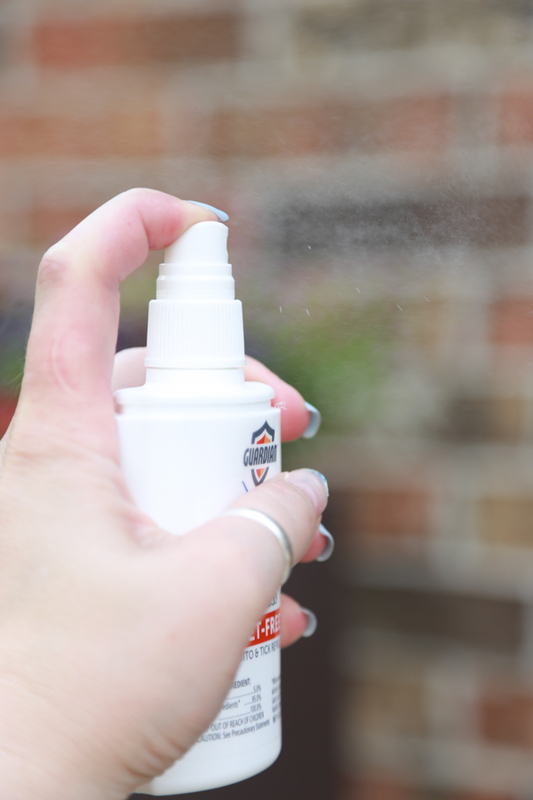 It comes in an easy to spray bottle and each spray covers a large area. After spraying on skin, use your hand to spread evenly over skin. You can purchase Guardian at your local Kroger store, but if you’re not close to a Kroger, you can also purchase online from Amazon. If you purchase from Kroger by June 13th, you can earn a $1.00 Ibotta rebate. After the 13th, enjoy 25% off at Kroger stores. What outdoor summer activities does your family enjoy? What a fantastic idea. I have never made my own before, but since we use so much of it around here, I am going to try!! That looks like so much fun for the kids to do! I hope it’s easy to come off! I would love to try this. Well, that’s super fun! There’s nothing better than doing some art on a HUGE scale and then just cleaning it up with a hose. That is awesome! My daughter loves to get out and do ginormous art pieces with sidewalk chalk and paint. I think she gets a charge out of the graffiti feel of it all. This looks like so much fun! 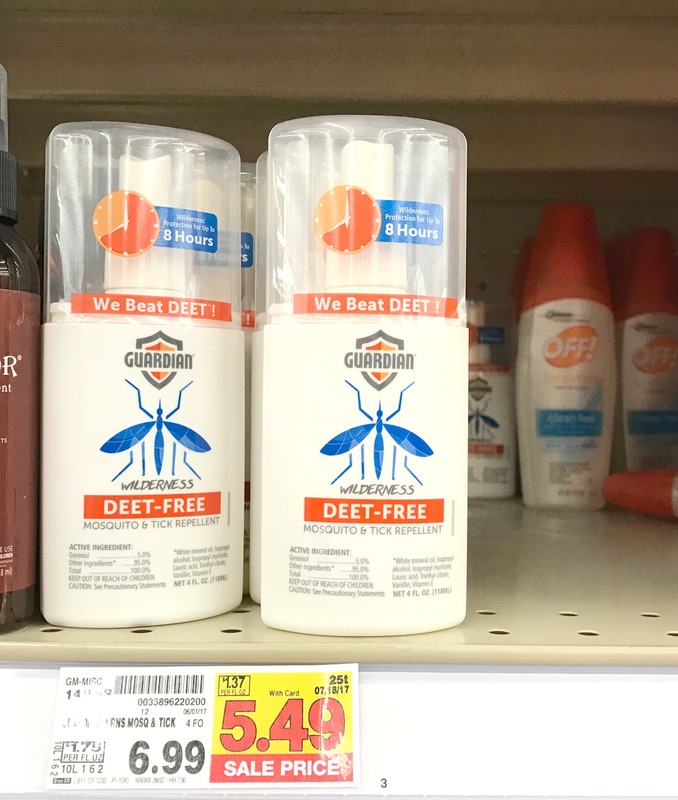 And I love the deet free product, I will look for that to send with my son to sleep away camp, my city kid hates getting bitten! This looks like so much fun, there is nothing like getting to paint on the paths when you are a child. Making our own sidewalk paint would be great! 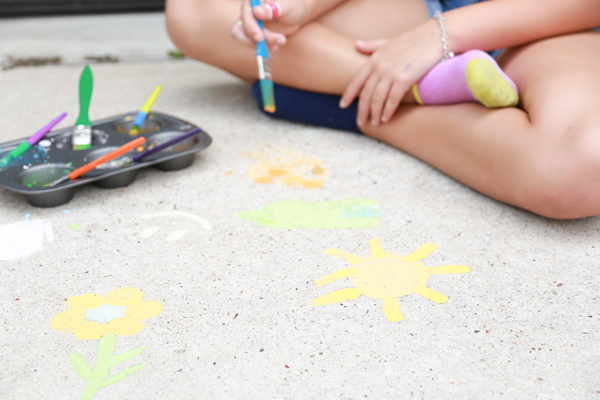 My grand children would have fun making masterpieces on the sidewalk and driveway. This will be our weekend activity! The mosquito repellent spray looks like a safe one to use on young kids. Got to get that too. This looks like such a fun summer activity. I know the kids would have a lot of fun with it. This is such a great idea. I will have to make some sidewalk paint when my niece and nephew come over. I had never worked with sidewalk paint but it is absolutely brilliant. I love how beautiful the colors came out – especially once painted on the pavement. ‘My kids are going to love this! It is exciting that I have everything we need in the house- maybe we could after dinner. That looks like a lot of fun and one activity that my daughter will go crazy for. 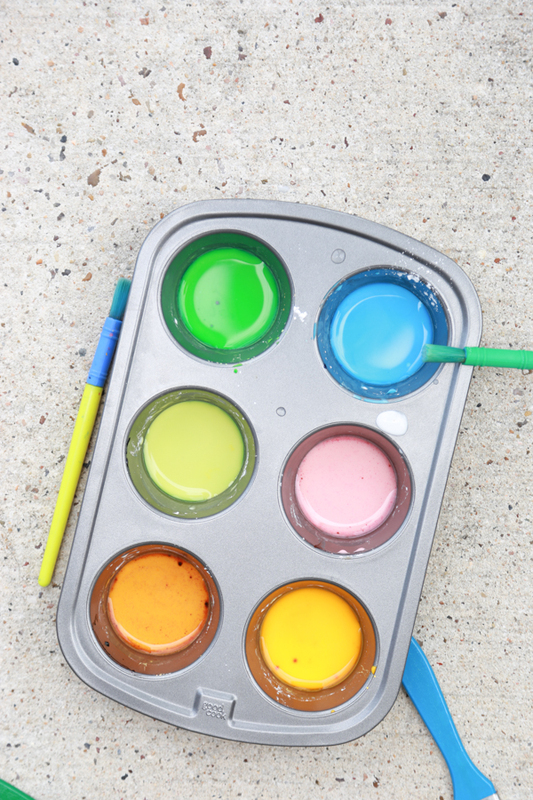 I really like the idea of making your own sidewalk paint! It’s pretty amazing. It’s also important to keep them protected from ticks and mosquitoes. I have been looking for a bug spray I feel co fortable using on my granddaughter. This looks perfect! The citrus vanilla scent sounds good, most bug products smell pretty badly. I’ve never seen anyone make their own sidewalk paint before, it’s super creative. What an awesome idea! This would be so fun with the kids! What! How cool is this? I didn’t even know this was a thing you could do! How fun! I would love to make this for my kids. They LOVE sidewalk chalk and paint. this would keep them busy for a while! 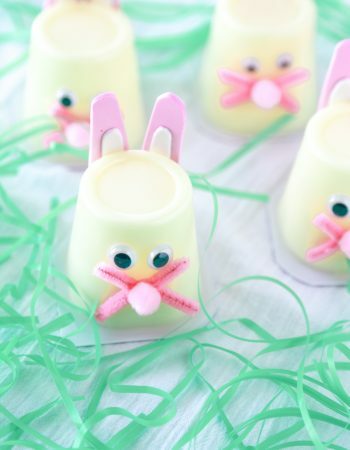 This is a fun activity for the kids. I love that it will make them go out and play and practice their creative skills too. Thanks for the reminder to get a mosquito repellent spray too. It’st that time of year ! I love it. I love anything that gets kids outside more. Even though, when some of these higher temps hit, the only thing we want to do is hit the pool. That is a great idea. It is a perfect way to keep the kids busy during the summer. 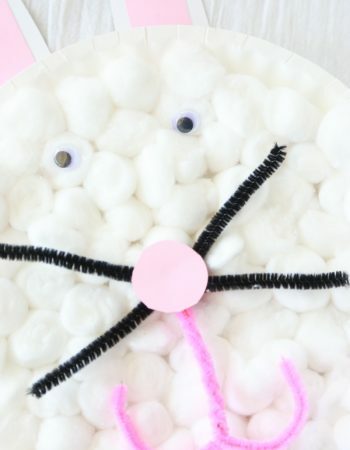 What a fun little craft for the kids! I think this is better than normal chalk! 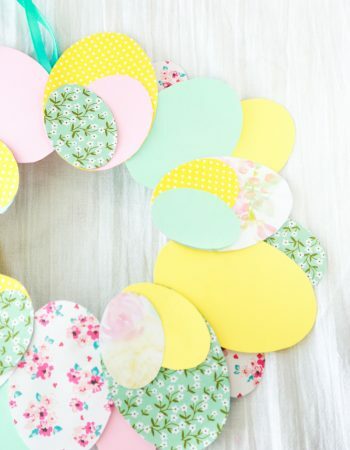 What an easy activity for summer! I have most of this already! Awesome DIY. 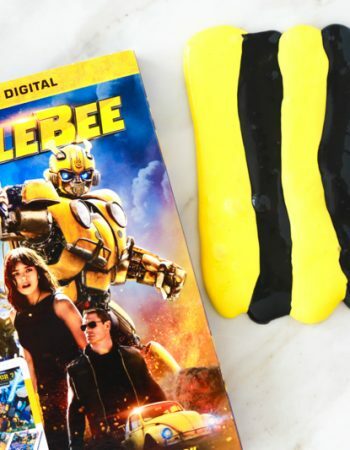 It is easy to make and my kids will love it.